Have you been avoiding dental work due to fear of discomfort? What if we could give you something that will allow you to remain awake and conscious but relax you, and help you just not care about the work being done? At Posh Dental, we can help you get the dental work you need to be done, without the fear of pain or discomfort. Dr. Gabriel does not want you to live with tooth pain or even to avoid dental cleanings because of fear. We can alleviate your concerns and help you relax through conscious sedation dentistry. As a form of conscious sedation that is inhaled, we offer nitrous oxide, also known as laughing gas. Nitrous oxide is considered a light form of sedation. It is administered through a mask that is placed over your nose. As the patient breathes in the gas, there is an immediate sensation of relaxation, not an uncontrollable fit of the giggles as shown on tv. Patients love this form of conscious sedation because it provides great relief while the mask is on, but the sensation almost immediately dissipates as soon as the mask is removed with very little after effects. • Safe: When used in a controlled environment by a medical professional, nitrous oxide is a very safe form of sedation. It is even recommended for children to relieve their anxiety in the dental chair. • Minimal: Though very effective, nitrous oxide is considered a minimal sedation. Its effects are strong while wearing the mask, but once removed, and the patient once again breathes regular oxygen, the effects vanish. 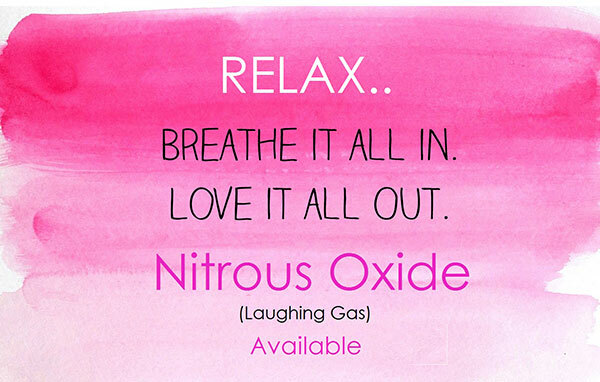 • Relax: Nitrous oxide has been found to provide the relaxed feelings that help put a patient at ease. Another form of conscious sedation is the use of oral medication. We can help put our patients at ease, with a strong relaxing sensation from the use of a prescribed oral medication. Depending on the patient and situation, we can prescribe a light to medium strength dosage. Oral sedation comes in the form of a pill or liquid that is taken an hour before the procedure. The dosage is light enough to allow you to be conscious, though often the patient will become very sleepy. Because of this sleepy effect, we do require that the patient has made arrangements for assistance when going home. Taking oral sedation will help the patient feel relaxed and alleviate their fears when having dental work completed. In some instances, patients have reported feeling nausea following their treatment. If you have been avoiding getting necessary dental work completed, please discuss this with our front office at Posh Dental. We can discuss options for you that will meet every need. Be sure to let us know of any medications or medical treatment that you are currently being treated with.